We have decided to separate "Horse Barns" page from all the other barns for a very simple reason - Horse Barn does not really belong to any certain construction type or style. In fact, you can build your horse barn using any type or style of construction you like. If money tree doesn't grow in your yard, and if you want to build an affordable horse barn, you might want to consider a regular pole barn, or perhaps a modular barn, if available in your area. A regular gabled roof built with trusses, low roof pitch and no loft will further save you $$$. Now, of course, if you want to build a solid looking barn with heavy beams, and don't mind spending a little extra, a Post & Beam barn is your answer. One feature you might want to consider when building your horse barn, is the Hay Loft. 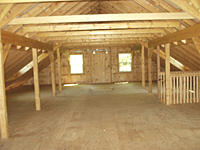 An economical way to build a loft, is to use Attic-Type Trusses. 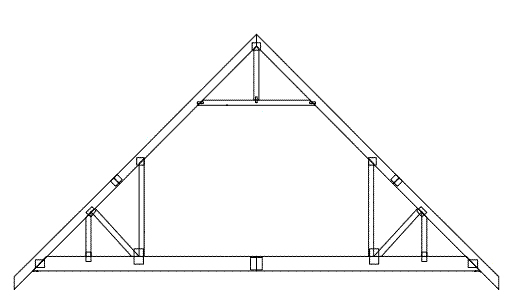 Unfortunately, with these type of trusses, you can only have a loft in the center of a barn (usually, above the center aisle). In order to achieve a full loft design (as shown), the roof must be built with rafters, which will cost little extra. In our opinion, building your barn roof with rafters (even if you are not planning to have a loft) has many advantages over the barn roof that's built with trusses. In fact, if you build your horse barn without loft, and still use rafters to build your roof, here is what you'll get. You'll have more headroom inside of stalls, you'll have an "Open-Space" look & more headroom inside the aisle, and if your roof is built with higher roof pitch, you'll be able to add a loft any time in the future (if you'll ever need one). One drawback of having a hayloft in your horse barn, is a possibility of higher insurance premium in some cases. Talk to your insurance agent before designing your barn. If you premium will increase significantly with an addition of a hayloft, you might want to consider building a slightly larger barn and adding a separate room for hay storage. Another feature you should consider is the big overhang (lean-to) on the side of your horse barn. Most of people will place horse stalls on the side where the lean-to is, so horses can walk out of their stalls through Dutch doors and stay under the lean-to. A lean-to will also act as a shelter or a run-in area for your horses and will help to keep your stalls cleaner and drier. Be ready to spend additional $14 - $16 per sq.f. for the open-type lean-to. Even if you are not building the horse barn, lean-to may be used to store all kind of things that require a roof shelter. 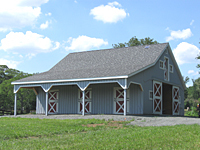 Lean-to overhangs vary from 6'-14' in width, 10'-12' being mostly used for horse barns and 8' lean-tos mostly used for storage barns and garages. Most important, when you are designing your horse barn, make your stalls as large as you can afford and the center aisle as wide as possible. Having plenty of headroom inside the stalls and the aisle is also a very good idea. A good horse barn design will have 12'x12' stalls, 12' wide aisle way and 10' of headroom inside of the stalls. Of course, we do realize that the stall size also depends on the size of horses. A very large horse 17+ hands might need bigger stall and ponies might be just fine with 10'x10' stalls. We perfectly understand that you want to save money (trust us, we do too), but what will happen if you build your horse barn for small horses using 10'x10' stalls, and later you decide to get a large horse? Or, what will happen if you ever want to sell your property? Just think how much harder it will be to sell your property with such a barn. You will miss all the potential buyers with large horses.